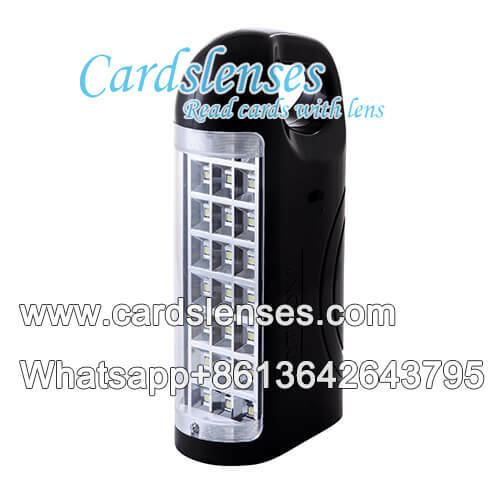 Special infrared lens emergency lamp is a kind of poker tricks product. With it you will win the poker game you play because you will know when to call, to raise and to fold in game. This emergency lamp IR poker cards camera is easy to use with. You need to find a suitable place to install the juice cards camera emergency lamp, and another place to place the monitor, a machine to watch the monitoring image. When you want to use them, you just need to connect with their cable. This juice poker cards camera has a master switch, but you can use a remote control instead. Including an IR marked cards camera, an infrared transmitting receives and a monitor. It can see both normal infrared playing cards and special IR marked cards. Use cable plug for power supply.